Home insurance, also commonly called homeowner's insurance (often abbreviated in the US real estate industry as HOI), is a type of property insurance that covers a private residence. It is an insurance policy that combines various personal insurance protections, which can include losses occurring to one's home, its contents, loss of use (additional living expenses), or loss of other personal possessions of the homeowner, as well as liability insurance for accidents that may happen at the home or at the hands of the homeowner within the policy territory. Homeowner's policy is a multiple-line insurance policy, meaning that it includes both property insurance and liability coverage, with an indivisible premium, meaning that a single premium is paid for all risks. The U.S. uses standardized policy forms that divide coverage into several categories. Coverage limits are typically provided as a percentage of the primary Coverage A, which is coverage for the main dwelling. Major factors in price estimation include location, coverage, and the amount of insurance, which is based on the estimated cost to rebuild the home ("replacement cost"). 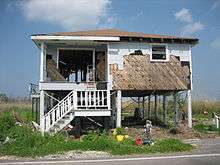 If insufficient coverage is purchased to rebuild the home, the claim's payout may be subject to a co-insurance penalty. In this scenario, the insured will be subject to an out of pocket fee as a penalty. Insurers use vendors to estimate the costs, including CoreLogic subsidiary Marshall Swift-Boeckh, Verisk PropertyProfile, and E2Value, but leave the responsibility ultimately up to the consumer. In 2013, a survey found that about 60% of homes are undervalued by an estimated 17 percent. In some cases, estimates can be too low because of "demand surge" after a catastrophe. As a safeguard against a wrong estimate, some insurers offer "extended replacement cost" add-ons ("endorsements") which provide extra coverage if the limit is reached. Prices may be lower if the house is situated next to a fire station or is equipped with fire sprinklers and fire alarms; if the house exhibits wind mitigation measures, such as hurricane shutters; or if the house has a security system and has insurer-approved locks installed. Typically payment is made annually. Perpetual insurance which continues indefinitely can also be obtained in certain areas. Home insurance offers coverage on a "named perils" and "open perils" basis. A "named perils" policy is one that provides coverage for a loss specifically listed on the policy; if it's not listed, then it's not covered. An "open perils" policy is broader in the sense that it will provide coverage for all losses except those specifically excluded on your policy. Basic "named perils" – this is the least comprehensive of the three coverage options. It provides protection against perils most likely to result in a total loss. If something happens to your home that's not on the list below, you are not covered. This type of policy is most common in countries with developing insurance markets and as protection for vacant or unoccupied buildings. Broad "named perils" – this form expands on the "basic form" by adding 6 more covered perils. Again, this is a "named perils" policy. The loss must specifically be listed to receive coverage. Fortunately, the "broad form" is designed to cover the most common forms of property damage. Special "all risk" – special-form coverage is the most inclusive of the three options. The difference with "special form" policies is that they provide coverage to all losses unless specifically excluded. Unlike the prior forms, all unlisted perils are covered perils. However, if something happens to your home, and the event is on the exclusions list, the policy will not provide coverage. In the United States, most home buyers borrow money in the form of a mortgage loan, and the mortgage lender often requires that the buyer purchases homeowner's insurance as a condition of the loan, in order to protect the bank if the home is destroyed. Anyone with an insurable interest in the property should be listed on the policy. In some cases the mortgagee will waive the need for the mortgagor to carry homeowner's insurance if the value of the land exceeds the amount of the mortgage balance. In such a case even the total destruction of any buildings would not affect the ability of the lender to be able to foreclose and recover the full amount of the loan. Home insurance in the United States may differ from other countries; for example, in Britain, subsidence and subsequent foundation failure is usually covered under an insurance policy. United States insurance companies used to offer foundation insurance, which was reduced to coverage for damage due to leaks, and finally eliminated altogether. The insurance is often misunderstood by its purchasers; for example, many believe that mold is covered when it is not a standard coverage. The first homeowner's policy per se in the United States was introduced in September 1950, but similar policies had already existed in Great Britain and certain areas of the United States. In the late 1940s, US insurance law was reformed and during this process multiple line statutes were written, allowing homeowner's policies to become legal. Prior to the 1950s there were separate policies for the various perils that could affect a home. A homeowner would have had to purchase separate policies covering fire losses, theft, personal property, and the like. During the 1950s policy forms were developed allowing the homeowner to purchase all the insurance they needed on one complete policy. However, these policies varied by insurance company, and were difficult to comprehend. The need for standardization grew so great that a private company based in Jersey City, New Jersey, Insurance Services Office, also known as the ISO, was formed in 1971 to provide risk information and it issued simplified homeowner's policy forms for reselling to insurance companies. These policies have been amended over the years. Modern developments have changed the insurance coverage terms, availability, and pricing. Homeowner's insurance has been relatively unprofitable, due in part to catastrophes such as hurricanes as well as regulators' reluctance to authorize price increases. Coverages have been reduced instead and companies have diverged from the former standardized model ISO forms. Water damage due to burst pipes in particular has been restricted or in some cases entirely eliminated. Other restrictions included time limits, complex replacement cost calculations (which may not reflect the true cost to replace), and reductions in wind damage coverage. Homeowner’s insurance was first introduced in the 1950s. Today, most homeowners’ insurance policies are based on forms developed by the Insurance Services Office (ISO) and the American Association of Insurance Services (AAIS). HO2 – Broad Broad "named perils" Broad "named perils"
HO3 – Special Special "open risks" Broad "named perils"
HO4 – Tenants No coverage Broad "named perils"
HO6 – Condominium Varies Broad "named perils"
A form that provides coverage on a home against fire, smoke, windstorm, hail, lightning, explosion, vehicles, and civil unrest. It does not cover the assured's personal property, personal liability, or medical expenses. It is the type of policy a mortgage lender will buy for a borrower if the latter's homeowner policy lapses. A basic policy form that provides coverage on a home against 11 listed perils; contents are generally included in this type of coverage, but must be explicitly enumerated. The perils include fire or lightning, windstorm or hail, vandalism or malicious mischief, theft, damage from vehicles and aircraft, explosion, riot or civil commotion, glass breakage, smoke, volcanic eruption, and personal liability. Exceptions include floods, earthquakes. Most states no longer offer this type of coverage. The Contents Broad, or Tenants, form is for renters. It covers personal property against the same perils as the contents portion of the HO2 or HO3. An HO4 generally also includes liability coverage for personal injury or property damage inflicted on others. Covers the same as HO3 plus more. On this policy the contents are covered on an open peril basis, therefore as long as the cause of loss is not specifically excluded in the policy it will be covered for that cause of loss. The form for condominium owners. It insures personal property, walls, floors and ceiling against all of the perils in the Broad Form. The rest of the condo is covered by a separate policy purchased by the association. The form is for the owner-occupied older home whose replacement cost far exceeds the property's market value. According to a 2015 National Association of Insurance Commissioners (NAIC) report on data from 2012, 76.8% of homes were covered by owner-occupied homeowners' policies. Of these, 62.9% had the HO3 Special, and 9.4% had the more expensive HO5 Comprehensive. Both of these policies are "all risks" or "open perils", meaning that they cover all perils except those specifically excluded. 2.7% were the HO2 Broad, which covers only specific named perils. Others, at about 1% each, include the HO1 Basic and the HO8 Modified, which is the most limited in its coverage. HO8, also known as older home insurance, is likely to pay only actual cash value for damages rather than replacement. The remaining 21.3% of home insurance policies were covered by renter's or condominium insurance. 14.8% of these had the HO-4 Contents Broad form, also known as renters' insurance, which covers the contents of an apartment not specifically covered in the blanket policy written for the complex. This policy can also cover liability arising from injury to guests as well as negligence of the renter within the coverage territory. Common coverage areas are events such as lightning, riot, aircraft, explosion, vandalism, smoke, theft, windstorm or hail, falling objects, volcanic eruption, snow, sleet, and weight of ice. The remainder had the HO-6 Unit-Owners policy, also known as a condominium insurance, which is designed for the owners of condos and includes coverage for the part of the building owned by the insured and for the property housed therein. Designed to span the gap between the coverage provided by the blanket policy written for the entire neighborhood or building and the personal property inside the home. The condominium association's by-laws may determine the total amount of insurance necessary. E.g., in Florida, the scope of coverage is prescribed by statute – 718.111(11)(f). In addition, about 1.9% of homes were covered by a dwelling fire policy (the term dwelling fire comes from the fact that, originally, these home owner's policies only covered fires) which covers property damage to a structure and is typically sold to noncommercial owners of rented houses. It may also cover the owner's personal property (such as appliances and furnishings). The owner's liability may be extended from their own primary home insurance and, thus, may not comprise part of the Dwelling Fire policy. It should be noted that not all states allow the ISO forms to be utilized or may require that additional clauses are included to meet state insurance regulations. Typically consumers can save money by purchasing their insurance directly from a company rather than through an agent, but there are not many companies selling home insurance directly. However, an experienced agent can provide expertise (especially expertise with the local insurance environment) that a company may lack. While coverage limits can vary, there are 6 core coverage components make up a standard policy in the United States. These are based on standard Insurance Services Office or American Association of Insurance Services forms. Covers other structures around the property that are not used for business, except as a private garage. Typically limited at 10% to 20% of the Coverage A, with additional amounts available by endorsement. Covers personal property, with limits for the theft and loss of particular classes of items (e.g., $200 for money, banknotes, bullion, coins, medals, etc.). Typically 50- 70% of Coverage A is required for contents, which means that consumers may pay for much more insurance than necessary. This has led to some calls for more choice. There are two types of policies for personal property: cash value policy and replacement cost policy. Cash value policy will pay the cost to replace belongings, minus deprecation. Replacement cost policy will reimburse the assured for the full, current cost of replacing belongings. Designed to pay for medical expenses to others who are accidentally injured on an insured location or by the activities of an insured, resident employee, or an animal owned by or in the care of an insured. These payments are not based on the law of negligence; that is, no negligence on the part of the insured has to be proven for payment to be made. Flood damage is typically excluded under standard homeowners' and renters' insurance policies. Flood coverage, however, is available in the form of a separate policy both from the National Flood Insurance Program (NFIP) and from a few private insurers. Earth movement is a common exclusion for home insurance policies around the world. A separate policy, rider, or endorsement must usually be purchased in order for this peril to be covered. Because of the catastrophic nature of this risk, earthquake related coverage is typically back by some form of government organization or specialized organization to assist with claims payout and regulation. Includes a variety of expenses such as debris removal, reasonable repairs, damage to trees and shrubs for certain named perils (excluding the most common causes of damage, wind and ice), fire department charges, removal of property, credit card / identity theft charges, loss assessment, collapse, landlord's furnishing, and some building additions. These vary depending upon the form. According to the 2008 Insurance Information Institute factbook, for every $100 of premium, in 2005 on average $16 went to fire and lightning, $30 to wind and hail, $11 to water damage and freezing, $4 for other causes, and $2 for theft. An additional $3 went to liability and medical payments and $9 for claims settlement expenses, and the remaining $25 was allocated to insurer expenses. One study of fires found that most were caused by heating incidents, although smoking was a risk factor for fatal fires. After a loss, the insured is expected to take steps to mitigate the loss. Insurance policies typically require that the insurer be notified within a reasonable time period. After that, a claims adjuster will investigate the claim and the insured may be required to provide various information. Filing a claim may result in an increase in rates, or in nonrenewal or cancellation. In addition, insurers may share the claim data in an industry database (the two major ones are CLUE and A-PLUS), with Claim Loss Underwriting Exchange (CLUE) by Choicepoint receiving data from 98% of U.S. insurers. As in the US, mortgage lenders within the United Kingdom (UK) require the rebuild value (the actual cost of rebuilding a property to its current state should it be damaged or destroyed) of a property to be covered as a condition of the loan. However, the rebuild cost is often lower than the market value of the property, as the market value often reflects the property as a going concern, as opposed to just the value of the bricks and mortar. A number of factors, such as an increase in fraud and increasingly unpredictable weather, have seen home insurance premiums continue to rise in the UK. For this reason, there has been a shift in how home insurance is bought in the UK—as customers become a lot more price-sensitive, there has been a large increase in the amount of policies sold through price comparison sites. In addition to standard home insurance, some 8 million households in the UK are categorized as being a "non standard" risk. These households would require a Specialist or Non Standard insurer that would cover home insurance needs for people that have criminal convictions and/or where the property suffers subsidence or has previously been underpinned. Building covers both the primary structure as well as detached structures such as garages, sheds, and back houses that are on property. However, different insurers may not cover things like boundary walls, fences, gates, paths, drives or swimming pools, so it is important to check the specific policy language. This is an equivalent of both Coverage A and B in homeowners insurance policies in the United States. Contents insurance covers just about everything that would fall out of your home if you turned it upside down. This include your furniture, clothes, electronics, jewelry, etc. Most polices limit the individual amount of money paid out for each category of items. Individual polices can vary in the amount of coverage they provide. The option to schedule your personal property is readily available. Liability is typically bundled together with building and contents coverage. Injuries and damage on premises would be covered by building coverage liability while any offsite occurrences would be covered under contents coverage. ↑ Nance CP. (2003). Modern Real Estate Practice in Texas p. 39. 1 2 3 4 5 6 7 8 Covered by homeowners insurance? Don't be so sure. CNN Money. WebCite archive. ↑ "Insurers Continue to Improve Their Home Valuations, Says MSB". www.insurancejournal.com. Retrieved 2016-01-17. ↑ "Basic causes of loss form (ISO) – Insurance Glossary | IRMI.com". www.irmi.com. Retrieved 2016-06-07. ↑ "Broad causes of loss form (ISO) – Insurance Glossary | IRMI.com". www.irmi.com. Retrieved 2016-06-07. ↑ "Special perils – Insurance Glossary | IRMI.com". www.irmi.com. Retrieved 2016-06-07. ↑ Murphy, Kate (2010-03-03). "Shifting Soil Threatens Homes' Foundations". The New York Times. Retrieved 2014-01-02. ↑ Hunt, Jr., Frederick J. (1962). "Homeowners – The First Decade" (PDF). Proceedings of the Casualty Actuary Society. Retrieved 2014-01-02. ↑ ^ Wiening, Eric; George Rejda; Constance Luthardt; Cheryl Ferguson (2002). Personal Insurance (1st ed.). Malvern, Pennsylvania: American Institute for Chartered Property Casualty Underwriters/Insurance Institute of America. ISBN 0-89463-108-X. ↑ Schwarcz, Daniel. "Reevaluating Standard Insurance Policies" (PDF). utexas.edu. 1 2 "Consumer's Guide to Homeowner Insurance". Vermont Department of Financial Regulation. Retrieved 2016-06-14. 1 2 3 "Dwelling Fire, Homeowners Owner-Occupied, Homeowners Tenant, Condominium/Cooperative, and Unit Owners Insurance: Data for 2012" (PDF). NAIC.com. National Association of Insurance Commissioners. Retrieved 2016-06-14. ↑ Willis G. (2006). Getting homeowners insurance 5 Tips Home Edition: What to do if you have no coverage. 1 2 "Residential Insurance: Homeowners and Renters". Retrieved 2016-06-06. ↑ Rebecca Mowbray. (March 22, 2009). Contents coverage reforms urged. The Times-Picayune. ↑ On a Leash: Dog Bite Insurance Claim Trends. Insurancejournal.com. ↑ "medical payments, homeowners – Insurance Glossary | IRMI.com". www.irmi.com. Retrieved 2016-06-06. ↑ "I.I.I. facts and stats on flood insurance". Insurance Information Institute. Retrieved 2014-02-07. ↑ "E.E.R.I earthquake reinsurance". Earthquake Engineering Research Institute. Retrieved 2016-06-14. ↑ The Academy of Producer Insurance Studies. (2000). The Insurance Essentials Handbook, pp. 77–91. The National Alliance for Insurance Education & Research. ↑ 5 problems that could be hiding in your home insurance policy. InsureMe.com. ↑ Homeowners Confused About Insurance Coverage: Survey. InsuranceJournal.com. ↑ The I.I.I. Insurance Fact Book 2008. p. 85. Retrieved 2014-01-02. ↑ Runyan CW, Bangdiwala SI, Linzer MA, Sacks JJ, Butts J (September 1992). "Risk factors for fatal residential fires". N. Engl. J. Med. 327 (12): 859–63. doi:10.1056/NEJM199209173271207. PMID 1508246. ↑ A-PLUS Property Database. ISO. ↑ Claims that boost your insurance rates. Bankrate.com. 1 2 "UK Insurance Key Facts 2014 ABI". www.abi.org.uk. Retrieved 2016-06-14. ↑ Australian Securities & Investments Commission (2016-01-07). "Home & contents insurance – ASIC's MoneySmart". www.moneysmart.gov.au. Retrieved 2016-06-08.